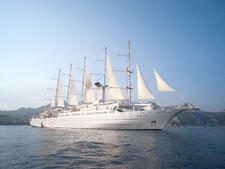 When Star Pride made its debut in Barcelona, it was quite the departure for Windstar. 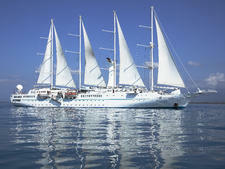 The cruise line had long been known for its fleet of three masted ships: Wind Surf, Wind Star and Wind Spirit. After acquiring three 212-passenger luxury yachts from Seabourn, it was quick to roll out the new ships, doubling the size of the fleet and expanding the image of the brand in a single year. Star Pride was the first of the trio to debut in May 2014. Though sail-less, the yacht maintains the small ship ambiance, the laid-back luxury and the level of service for which Windstar is known. A 2016 renovation has brought Star Pride in line with sisters Star Breeze and Star Legend, which benefited from larger refurbishments before joining the fleet. Public spaces and dining venues were remodeled to a nautical theme, using lots of blues and earth tones. New carpets and tile flooring were added to stairwells and all indoor public spaces, and the Owner's Suites were completely renovated, featuring enhancements to an expansive private deck, which commands a sweeping ocean view over the yacht's bow. Other ship highlights include larger suites with expansive bathrooms and large walk-in closets, great ocean views throughout, an impressive spa and salon menu and an expanded top deck (Deck 8), which allows for more room and loungers. The watersports platform -- with everything from standup paddleboards to diving and snorkeling equipment -- reflects the ship's more active ambiance. Passengers seek out the line for its sportiness, as well as its relaxed, yet sophisticated sense of luxury. Star Pride cruisers are sophisticated, yet refreshingly unfussy. They skew much younger (40s to 60s) and are much more active than we have seen on other similar-sized ships. We encountered a mix of people who had traveled with other lines, were on their second or third Windstar cruise or were first-time cruisers (as was the case with one travel-savvy, 30-something couple on our cruise). 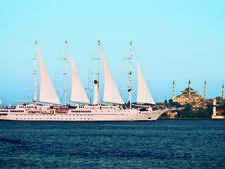 Windstar is known for cruising into lesser-known and smaller ports, as well as the iconic destinations. They are also known for pulling into ports very early in the morning and staying as late in the day as possible. 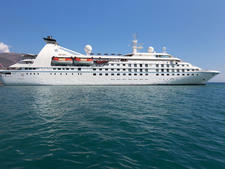 You will get a full day and in some cases, a full night in port, making Star Pride a great choice for active explorers. In addition, the line offers a complimentary private event in port on nearly every cruise, which could be a beach party, a tour and lunch at a winery, or an evening soiree with food and drink in a Roman villa. Another hallmark of the brand is the staff, which shines from the time you arrive. Crew members seem to know every passenger by name and what they typically drink, upon arrival. In line with the laid-back, no-fuss, fun factor, the staff throws down not once, but twice, in a pretty sassy talent show in the Lounge and with a line dance extravaganza at the deck party. We were left wondering who was having more fun, the passengers or the crew? If you are one for drama or nostalgia, the "1492" theme song is played daily during the Star Pride Signature Sail-Away. It is well worth the daily race up to the Star Bar on the Star Deck to hear the song, watch flags raise and locals wave, all the while enjoying a drink in hand and stunning views all around. It never got old. The majority of Star Pride passengers are American, with a fair amount hailing from Canada and Australia. You'll also find cruisers from Mexico and a mix of European countries. Most passengers are fit, or at least active. They are typically sophisticated, well-traveled and business-savvy folks in their 30s to 70s, with the majority in their mid-40s to mid-50s. Most are couples, though you might see some family groups (especially ones with older or grown children). Cruise Critic’s professional photographers and our extraordinary community members have taken 873 pictures of Windstar Star Pride. When you visit our photo galleries, you can be assured that what you see is what you get. The dress code is casual and comfortable, with both men and women wearing shorts and jeans by day. At night sneakers, jeans, tanks and tees are prohibited in AmphorA, the main dining room. Outside of those restrictions, the dress code is pretty loose and casual, far more than we would have expected. Men wear slacks and Polo or button-down shirts, no jacket, while women wear cute tops with slacks or a skirt or a casual dress. Do not pack suits, ties or fancy dresses. All meals in all venues at all times, including the 24/7 room service menu, are free of charge. 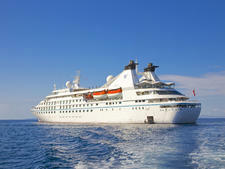 Also included in the fare are welcome cocktails on embarkation day, all onboard entertainment, unlimited use of the fitness center and water sports equipment and DVD rentals. One shoreside event, called the Destination Discovery Event, is free of charge but not available on all cruises. Alcohol, shore excursions, airport or hotel transfers, spa treatments and Wi-Fi cost extra. Tips are $13.50 per person, per day, payable at the end of the cruise via your onboard account. The spa and the bar automatically add on an additional 15 percent for each service or alcoholic beverage ordered. Additional tipping is at your discretion.